Precision Metering & Adhesive Dispensing Equipment | Spray Quip, Inc.
Our expert sales team can assist in determining the equipment needed based on whether your dispensing and metering equipment is for single component displacement meter system for medium to high viscocity mastic material that needs to be dispensed in precise beads, or if you require servo motor driven pump for gasket applications of silicone and urethane materials. We offer Graco, Liquid Control, Nordson, J. Dedoes brands and SQ OEM Customized Solutions of single and plural component, manual and automatic pumping & metering systems and accessories. 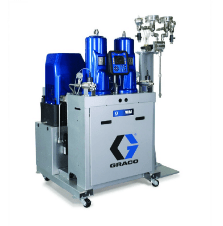 Graco – PrecisionFlo, Precision Dispense, Precision Swirl, Dispensit, PGM, PCF, PR70, HFR, HVR, SmartWare, RIM Cell LT and DL; J. Dedoes – Meter-Rite shot meters.